1. You have three baskets filled with fruits. One has mangoes, one has bananas, and the third has a mixture of mangoes and bananas. You cannot see the fruit inside the baskets. Each basket is clearly labelled. Each label is wrong. You are permitted to close your eyes and pick one fruit from one basket, then examine it. How can you determine what is in each basket? Pick up a fruit from the basket labelled Mangoes and Bananas. If the fruit is banana then we must be certain that that box contains only Bananas as it must not contains Mangoes and Bananas mixture. Now from the table possbile combinations of remaining two baskets can be seen. Basket 1 should not contain Mangoes but contain Bananas / Mango and banana mixture. But we already confirmed that basket 3 contains all bananas. 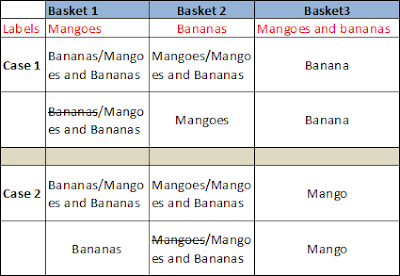 So basket 1 must have mangoes and bananas mixture. Basket 2 must contain Mangoes. Similary logic we can apply for the scinario if we pick up Mango. What all this means is that X is going to be 24 raised to the power of 23 to the power of 22 to the power of 21 ... and so on, all the way upto 3 to the power of 2 to the power of 1. That’s 23 nested exponentiations. X is a very big number. However the correct answer is zero. Among the 26 terms which are being multiplied, there will be (X - X). Which is 0. Hence answer is 0. It doesn’t matter what all the other terms are. Multiply anything by 0 and you get 0. 3. You have a bag full of feathers of three colours - red, green, and blue. With your eyes closed, you have to reach the bag and take out two feathers of the same colour. How many feathers do you have to take to be certain of getting two of the same colour ? Four. Pick just three feathers, and it’s possible you have one of each colour and therefore no match. With four feathers, at least two have to be of same colour. Assume there is only one robber. Then he votes himself so he gets 100% of the votes and takes all the 100 coins. If there are two robbers, D and E. Say D is senior. In this case D votes for himself and gets 50% of votes and takes all coins. Observe If D is the senior E gets nothing. If there are 3 robbers, C, D and E. Say C is senior. Now C has to get atleast one more vote to survive. As his votes consists only 33.33% of total votes. He thinks like this. If D is the senior, E gets nothing. So let us offer "One gold coin" to E. Now E obviously votes for C Because, if D is the senior, he gets nothing. If there are 5 robbers, A, B, C, D and E. A has to get atleast two more votes to survive. If D is the senior, C and E both gets nothing. So he offers one coin each to get their votes and keep remaining 98 coins with him. Very interesting. is it not?! 5. There is an old bridge over river Ganga. Four people wants to cross the bridge at night. Many plants are missing, and the bridge can hold only two people at a time (any more than two, and the bridge collapses). The travellers must use a torch to guide their steps; otherwise they’re sure to step through a missing space and fall to their death. There is only one torch. The four people each travel at different speeds. Sharukh can cross the bridge in one minute; Aamir in two minutes; Salman takes five minutes; and the slowest person, Saif, takes ten minutes. The bridge is going to collapse in exactly seventeen minutes. How can all four people cross the bridge? Round - trip one: The fastest pair, Sharukh and Aamir cross, taking two minutes. One of them (let’s say Sharukh - it doesn’t matter) immediately returns with the torch (one minute). Elapsed time: there minutes. Round - trip two : the slow pair, Salman and Saif, cross taking ten minutes. As soon as they reach the farside of the bridge, they hand the torch to the faster person who is already there. (That’s Aamir, assuming that Sharukh returned in the first round - trip). Aamir returns the torch to the nearside (two minutes). Elapsed time : fifteen minutes. Final, one - way trip : the fast pair is now reunited on the nearside. They cross for the second and last time (two minutes). Elapsed time : seventeen minutes. 6. You have two candles. Each will burn for exactly one hour. But the candles are not identical and do not burn at a constant rate. There are fast-burning sections and slow-burning sections. How do you measure forty-five minutes using only the candles and a lighter? At time zero, light both ends of candle A and one end of candle B. The candles must not touch each other. It takes thirty minutes for candle A’s two flames to meet. When they do, there is exactly thirty minutes left on candle B. Instantly light the other end of (still-burning) candle B. The two flames will now meet in fifteen minutes, for an elapsed time of forty-five minutes. 7. One of your female employees insists on being paid daily in silver. You have a silver bar whose value is that of seven days’ salary for this employee. The bar is already segmented into seven equal pieces. If you are allowed to make just two cuts in the bar, and must settle with the employee at the end of each day, how do you do it ? You need a one-unit piece to pay the employee for the first day’s work. You lop one unit off the end and hand it to the employee. This leaves you with a six - unit bar and one more permitted cut. This leaves you with a four - unit bar, the one - unit piece you got in change, and no more cuts. On the third day, you return the one - unit piece. On the fourth day, you hand over the four - unit piece and get the two smaller ones as change. Use them to pay the worker on the fifth, sixth, and seventh days. 8. Five men crash-land their airplane on a deserted island in the South Pacific. On their first day they gather as many coconuts as they can find into one big pile. They decide that, since it is getting dark, they will wait until the next day to divide the coconuts. The night each man took a turn watching for rescue searchers while the others slept. The first watcher got bored so he decided to divide the coconuts into five equal piles. When he did this, he found he had one remaining coconut. He gave this coconut to a monkey, took one of the piles, and hid it for himself. Then he jumbled up the four other piles into one big pile again. To cut a long story short, each of the five men ended up doing exactly the same thing. They each divided the coconuts into five equal piles and had one extra coconut left over, which they gave to the monkey. They each took one of the five piles and hid those coconuts. They each came back and jumbled up the remaining four piles into one big pile. What is the smallest number of coconuts there could have been in the original pile? Assume total number of Coconuts are N.
After given one coconut to monkey and has taken first man his share, then 4A coconuts are remaining. 9. A woman took a certain number of eggs to the market and sold some of them. A next day, through the industry of her hens, the number left over had been doubled, and she sold the same number as the previous day. On the third day the new remainder was tripled, and she sold the same number as before. On the fourth day the remainder was quadrupled, and her sales were the same as before. On the fifth day what had been left over were quintupled, yet she sold exactly the same as on all the previous occasions and so disposed of her entire stock. (i) What is the smallest number of eggs she could have taken to market the first day? (ii) How many did she sell daily? (The answer is not zero). Let us make small table to understand this question clearly. Right hand columns tells us the number of eggs sold. 10. Doo-Bee-Doo had born on 1468 B.C. He had lived one-fourth of his life as a boy, one-third of his life as a youth, one-fifth of his life as a man and the remaining 52 years as an old man. Which year did Doo-Bee-Doo die?